This project was conceived as a gift for Maneau and Jake’s 10th anniversary (June 2015). Jake (York) is of Scottish descent which meant something of a Celtic nature would befit. 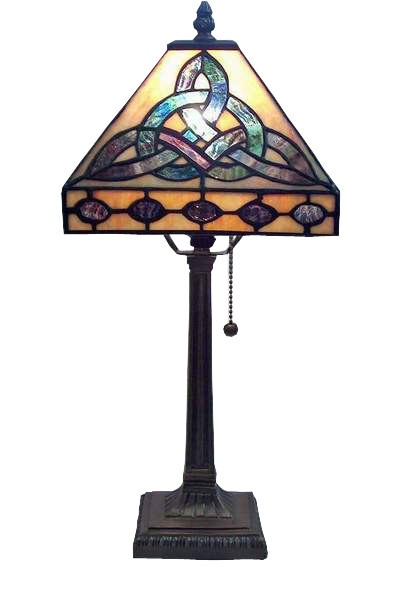 Plus I wanted to make them a lamp so I searched the internet for “celtic stained glass lamp” (love Google) and found this one that looked intricate yet simple enough for a medium sized table lamp. Since all I had to work with was this internet image, I had to draw the pattern by hand (love that!). I made the bottom of the lamp shade 10″ and the top 2.75″ to fit the nearest sized vase cap. I altered the pattern slightly so that the knot thread always follows the over/under pattern of a true Celtic design (this one I found on the internet was close but not 100% accurate). For the glass in the knot, I used the same Urobos iridescent glass that I used on the birds in the Schiffer Villa panel. That way the lamp would glow at night whether lit or unlit. For the background, I chose a peach/orange opalescent. I found a 14″ Mission style lamp base online like the one shown in the picture. When it arrived, I decided it was too big so I ordered a 12″ base…much better! (I’ll keep the 14″ one for another project). I spent the weekend of Jan 17/18 cutting out the pattern, then tracing and rough cutting the glass for the whole project (12 hrs – 176 pieces). The long background edge pieces of the main panel were especially tricky because of the narrow design along the edges and I broke several pieces trying to get the curvy cut-outs. Future note to self… make the pieces at least 1/2″ wide at the narrowest point. The next weekend (Jan 24/25) was for grinding. I got a good start on the task (7 hrs) and finished the background of all four panels plus the 20 ovals for the border pieces. I had to pause there for a few weeks because on the following weekend (Feb 1), Monica and I flew away for a 2 week Caribbean vacation to Nevis and St. Maarten. I was dreaming of warm beaches as I cut and ground glass and then later, dreaming of glass as I lay on warm beaches. March 8th – Back from vacation and back to the grind. Beautiful Sunday morning. A slow but happy start on the knot grinding (2 hrs). March 22 – got the first panel fit, foiled and soldered (3 hrs). It felt good to proceed and get back to the practice of soldering. Sarah and Matt came to visit on Sunday and Matt helped select the colors for the knot in the second panel. How wonderful to see someone else take an interest. March 28/29 – finished the three remaining upper panels (foiled & soldered) plus finished foiling all pieces for the borders (10 hrs). April 4 (Easter weekend). Soldered the four border panels. Then assembled and finished the lamp (5 hrs).